The expanding market of non-dairy alternatives and accelerating widespread disapproval of animal agriculture has left the dairy industry worried and desperate. The expanding market of non-dairy alternatives and accelerating widespread disapproval of animal agriculture has left the dairy industry worried and desperate. A leading dairy consultant stated at a conference last month that if the vegan movement continues to succeed, "We will not have a dairy industry in five to ten years." In an attempt to counteract veganism and paint this dying industry in a positive light, dairy marketers coined the term ‘Februdairy.’ A spinoff and retaliation to the hugely successful Veganuary campaign, Februdairy aims to mislead the public into believing in the many myths of "humane," "healthy," and "sustainable" dairy. Consumers are increasingly choosing plant-based alternatives over cruelty-laden dairy products. Delicious non-dairy milk, yoghurt, cheese, and ice cream are ubiquitous in grocery stores across the world, making it easier than ever to choose compassion over cruelty. Read on to learn five reasons why so many people are leaving dairy products off the menu. 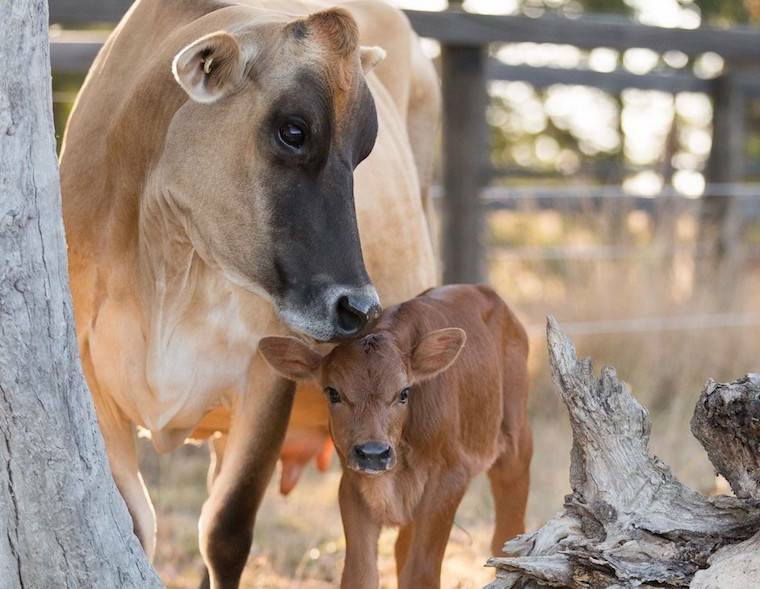 Dairy cows—who feel the same unwavering love for their offspring as humans—have their motherhood stripped from them as soon as they give birth. After nine long months of pregnancy, these mothers face inconceivable emotional trauma when farmers forcibly tear their newborns away to prevent them from nursing. In order for the dairy industry to be profitable, farmers cannot allow calves to drink the milk that, by nature, is intended for them. As a result, every dairy product purchased—even those stamped with deceivingly happy images—directly contributes to the destruction of sacred familial bonds. Many people are appalled by the idea of eating veal (the meat of calves as young as a few weeks old). However, few people are aware that the dairy industry and veal industry are one and the same. 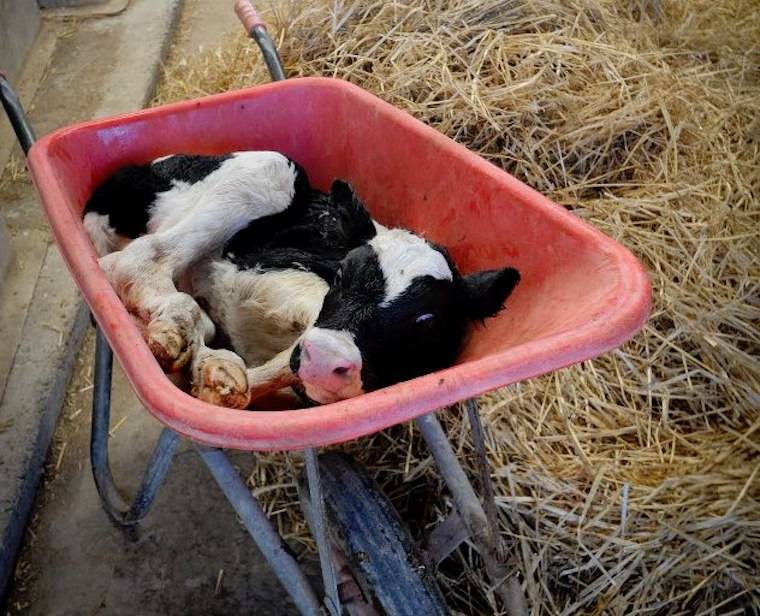 Male calves are useless to the dairy industry due to their inability to produce milk. 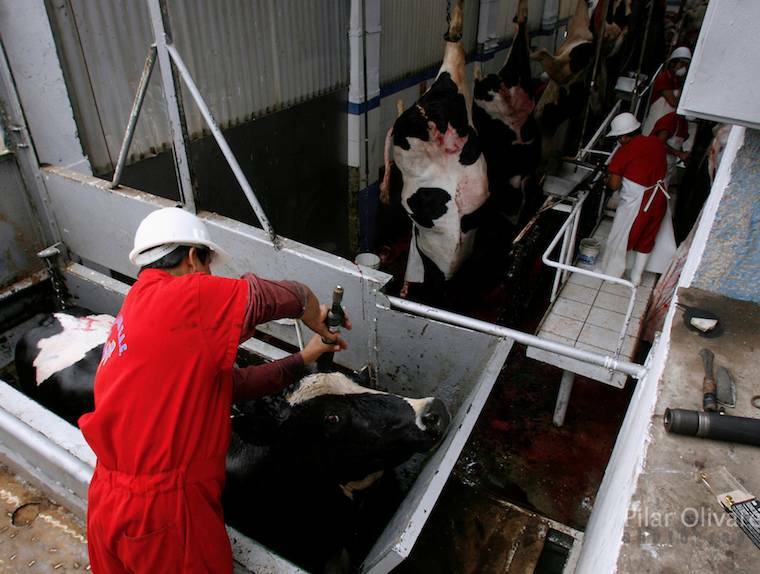 As a result, they are routinely killed to be sold for veal. Many compassionate consumers have decided to take a stand against the slaughter of innocent babies by refusing to support the dairy industry. When a cow becomes exhausted after years of anguish and abuse, her body is no longer profitable. She will be disposed of—dragged to slaughter, commonly while still pregnant. Viewed as mere milk machines that exist for human purposes, cows—who are sensitive and intelligent animals with unique personalities—are thrown away without a second thought as soon as their usefulness expires. Most "hamburger" is produced from dead dairy cows. The inherent cruelty required to produce dairy, on both factory farms and “humane” farms, is antithetical to the most fundamental beliefs of animal lovers. Contrary to multibillion dollar dairy ad campaigns, milk is not a health food. 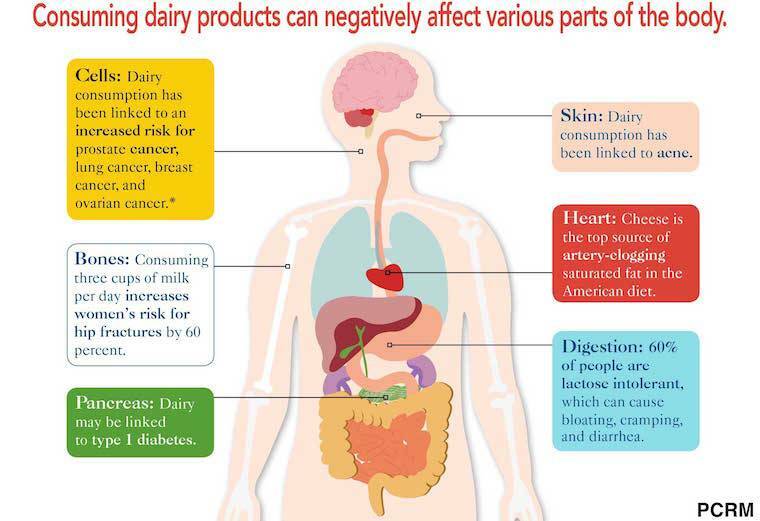 Many people choose to stop consuming milk due to the mounting evidence linking dairy consumption to a myriad of diseases, including breast and colon cancer. Touted as a remedy for strong bones, studies have also shown that countries consuming the most dairy actually have the highest rates of osteoporosis. Non-dairy alternatives are rich in nutrients, without the harmful saturated animal fats and cholesterol. 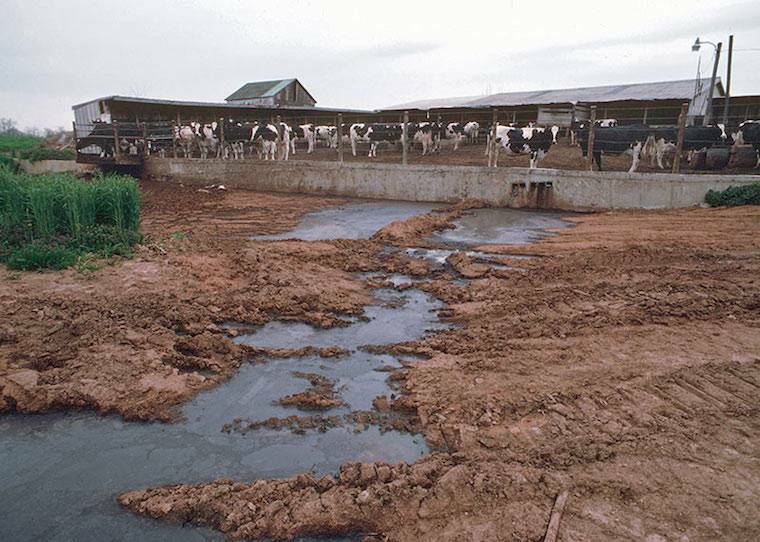 The dairy industry is responsible for a tremendous amount of pollution. The hundreds of millions of cows exploited annually for dairy produce incredible amounts of waste, which leads to grave air and water pollution. This places communities at risk of exposure to tainted water and dangerous gases. Requiring a staggering 1,000 gallons of water to produce just one gallon of milk, dairy production is also responsible for egregious water waste. 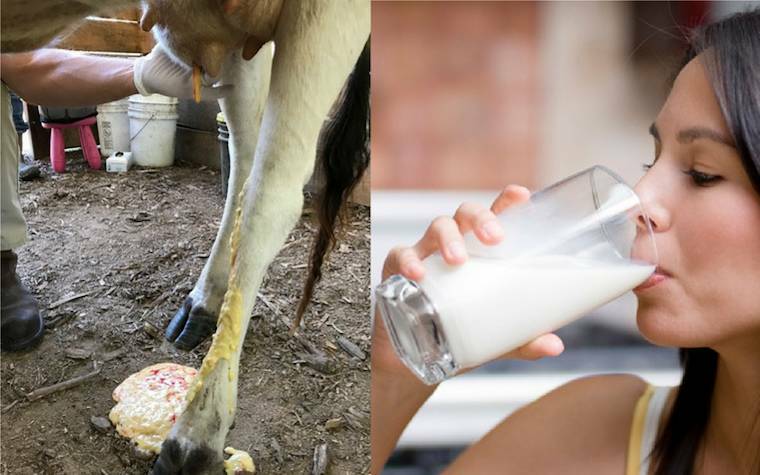 Many environmentalists choose to stop consuming dairy for the purpose of sustainability and environmental protection. Every time we purchase a product, we have a choice: compassion, or cruelty. Will we willfully ignore the immense harm caused by dairy consumption, or will we bear witness to the shocking reality of this industry and vote with our dollar in favor of kinder, healthier, and more sustainable alternatives.